As we were leaving the university following the hockey game last night the snow was beginning to fall again in earnest. It had been less than 12 hours since the earlier storm that had dropped nearly a foot of snow had moved on. Because the wind had caused the powdery snow to float and drift it is hard to say how much fresh lay on the ground when we awoke this morning. But suffice it to say that it was enough to require another visit by our plow guy to push the snow off the driveway adding several more inches to the mountain of snow piled up at the end of the drive. And it took another hour and a half for my husband and I to shovel the area in front of the garage and dooryard that the plow couldn’t reach. 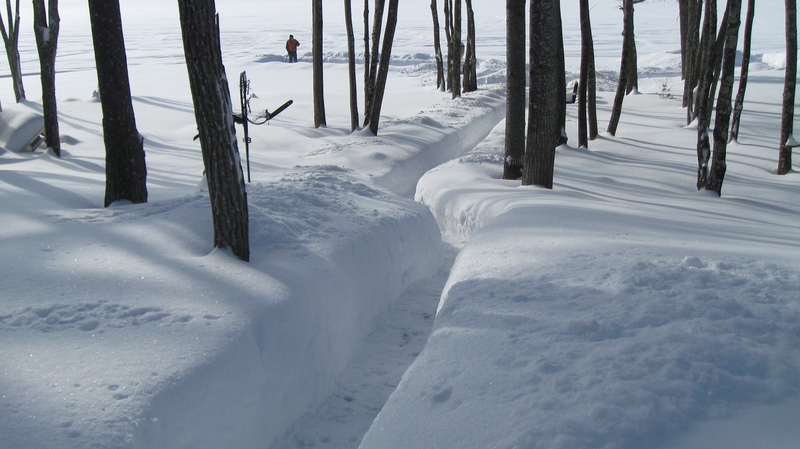 We also shoveled the front walk, the pathway down to the lake (where the dog likes to play Frisbee), in addition to access to the bird feeder and the compost bin. A repeat of what we had done yesterday morning. Snow can be pretty heavy, weighing between 15-20 pounds per shovel full. So an hour’s worth of moving snow with oversized snow shovels can add up to several tons, or the equivalent of a moderate workout at the gym. Not only does it exercise your resistance, done at a steady pace it offers a pretty good cardiac workout as well. But what I like best about shoveling snow is that you can see the immediate fruits of your labor. The area looks neater and it’s safer for your family and visitors as well. To be honest, I like snow shoveling for the same reasons that I enjoy lawn mowing, laundry, washing dishes, and preparing a meal. I can see right away the difference that my efforts have made. Yes, more snow will fall, clothes and dishes will be dirty again, and meals are eaten shortly after they are prepared. That’s OK because I am doing what I can to make my little part of the world a better, more comfortable place to live. And isn’t that be what we all try to do? This entry was tagged exercise, fruits of your labor, shoveling snow, snow storms. Bookmark the permalink.